This Blogs section is intended as an independent platform for members of the community to express their views and opinions on a wide range of subjects and to share relevant experiences for the benefit and information of the larger community. Views and opinions expressed here are exclusive to the writers and do not necessarily reflect those of the various TDB platforms. Back to Basics is a series of essays aimed to understand the profound impact of His Holiness Syedna Mufaddal Saifuddin’s TUS initiatives and programs that have come to the fore under his leadership. They seek to contextualise them in a contemporary framework, thereby highlighting the relevance and need of such visionary ideas. “Ding-ding!” As if tugged by an invisible rope, Zahra’s ears prick up as the doorbell chimes. As quick as a fiddle, she dashes to the door. As the door slides open, she is greeted with the familiar countenance of a smile that she instantly warms to. With open hands she reaches out, one hand firmly holding the handle at the top as the other wraps around the bottom. Before bidding farewell with a word of gratitude, she allows a moment for the warmth that exudes from the steel tins to emanate through her hands. As the door closes, she catches a whiff of cardamom that has been cooked with the rice and the piquant aroma of sautéed cumin in the daal, smiling to herself as she realises that her favourite is on the menu tonight. Zahra is one of thousands of young and old alike, who are greeted every day with a freshly cooked meal from the global community kitchen that is FMB, the brain-child of both His late Holiness Syedna Mohammed Burhanuddin RA and His Holiness Syedna Mufaddal Saifuddin TUS. At first, FMB may seem like a glorified kitchen service. But it is so much more than that. FMB, just like its product, is sourced from a deep rooted sense of common identity and community, produced in the clean environment of virtuous philanthropy, infused with a taste of culture, cooked with dollops of love, warmed with altruism, spiced with centuries of tradition and garnished with a sprinkling of divine blessing, all blended together to bring about physical and mental balance. One insightful article observes ‘The greatest thing that we have lost from our eating today is a sense of balance, whether it’s the balance of meals across the day or the balance of nutrients on our plate.’ The irony of the abundance of food cannot be ignored; we are surrounded by an unfathomable variety of foods to consume, yet the constituent nutrition and manner of consumption, is so hollow of anything remotely ‘healthy’ that our generation faces an unprecedented plethora of diet-related epidemics, from obesity to food intolerance. Both ancient traditional medicine, such as Ayurveda and Chinese medicine as well as contemporary medicine generally agree that ‘good health’ is ultimately about achieving a sense of balance. It is about reaching a point of equilibrium that balances mind and body, welfare and wellbeing, physiology and psychology, where both binary opposites co-exist in perfect tandem with each other, supporting and sustaining the other for the benefit of the whole. This duality that contributes to the ‘whole’ is inherently oppositional. The base instincts of hunger and need diverge from the knowledge seeking nature of the rational self; the virtue of altruism is contradictory to the need of self-survival and so on and so forth. In his magnum opus Rasāʾil Ikwān al-Safāʾ, (Epistles of the Brethren of Purity) Imam al-Ahmed al-Mastūr AS sheds light on how this duality can be prevented from being self-destructive and goes onto explain how a healthy balance can be achieved. The needs of both can be fulfilled when one acknowledges the other and understands that a harmonious existence leads to the optimal outcome for both. FMB is the re-balancing force of that duality. Linguistic anthropologist Kathleen Riley of Rutgers University notes that ‘When people look at their devices and send photos of their meal on social media, instead of talking to each other while they eat, they lose so much of the multi-sensuous aspects of food.’ Despite the exponential growth in use of the omnipresent smartphone, its ostensible function as a means of communication is clearly undermined. Humans were designed to interact and communicate through all five of their senses whereas electronic gadgets and social media serve to desensitise us. We become oblivious to the actual world around us and the sensual beings with whom we share a physical space and instead we opt to exist in the abstract realm of virtual reality, deluded by the vacuous connections that Facebook and its ilk promote. An inherent imbalance and disconnect has become the norm. FMB is redressing that imbalance. FMB is more than just a meal; it is a philosophy that informs a singular culture of communicating, first with yourself and then with all that is around you, both the animate and inanimate. FMB forces you to wake up and smell the proverbial coffee; see what you are eating – the morsels that are becoming an integral part of you, connect with the meal that is laid out in front of you; touch it with clean fingers rather than distancing yourself with forks and knives (you are not going into battle! ); let the aromas waft past your nostrils as the fragrant smell drifts upwards; hear the cacophony of conversations of your family and friends as they join together at the thāl and let your taste buds ignite with that pinch of salt that follows with a fusion of sweet and savoury dishes. FMB then, is not so much the sharing and consumption of a meal, but a reawakening of the senses. It is this form of ‘communicating’ where your senses communicate the signals perceived from one’s sensual environment to the heart and mind that is the first step in creating a ‘community’. The word loses all sense of meaning if one cannot communicate. In a society where the individual trumps the collective, atomisation has become the dominant hallmark of modern times. With the traditions and customs that FMB cultivate, the focus is brought back to social association. Just as a meal is not the product of any one individual’s labour or accomplishment, we are reminded that human prosperity and development lies in the sum of all our disparate parts. The inherent imbalance in the distribution of wealth in modern society is such that no other age has witnessed, bringing about a stark disparity between rich and poor. Calls for a more egalitarian society are mute in the face of the embedded ills of a capitalist world. FMB seeks to bridge that gap between the haves and have-nots of the world. There are many philanthropic initiatives with credible altruistic ends, but for the most part they are focused on the less privileged, such as community ‘soup kitchens’ and the like. FMB is unique because it addresses the gap more effectively; instead of the ‘upper class’ trying to uplift those who are less fortunate through acts of charity whilst they remain cemented in their positions of prosperity, FMB draws both ends of the spectrum to the middle. FMB is not for the less fortunate; it’s for everyone. That’s the point. Young or old, poor or rich, one’s socioeconomic status is not the criterion for eligibility. Rather, FMB brings to the fore the idea that true egalitarianism treads on the heels of an understanding that some needs are equal in nature. The rich man needs to eat just as much as the poor man. Hunger is a mark of the human condition and all of us – not just some – are human. Just as Bee Wilson notes in her book The Way We Eat Now, that ‘there is nothing middle-class about the desire to eat food that brings us both health and happiness,’ FMB underpins the common humanity that we all share. FMB is not just about the final product which is the meal; it incorporates within it every stage that precedes that penultimate act of consumption. From budgeting to procurement, from hygiene to nutrition, from preparation to production – all of it comes under one umbrella. More important though, is how, in doing so, it integrates every member of the community, irrespective of their status. No one feels as if they are being given handouts or pitied upon; rather, there is something innately empowering to stand hand in hand with a multimillionaire filling a container with steaming rice, and knowing full well, that you and he will be eating and even sharing, the same food tonight. We live in a world where perfect equality is unattainable. We are sufficiently pragmatic to realise this. But we must nevertheless strive to achieve that lofty ideal. His Holiness TUS himself insists on eating the very same food that is prepared in the FMB kitchen of the town or city he happens to be visiting. I can’t imagine anything being a more meaningful commitment to egalitarianism. We live in a post-industrial world, where automation and innovation obscures the vast and complex processes that are involved in putting that morsel of food in our mouth. Despite greater calls for more ‘organic’, ‘natural’, ‘sustainable sourcing’ as well as initiatives such as ‘farm-to-table’, the vast majority of us are completely oblivious to the resources that nature, more than anything else, has expended in providing for us. In fact, for the most part, artificiality in the form of genetically-modified foods to ‘mechanically separated meat’, has sapped the nature out of what originated as ‘natural’. Innovation should aim to preserve and not destroy that process of nature. FMB directives focus on the origin and end and everything in between. Of course FMB operates within the vast global network of food production, but given those limits, it aspires to recalibrate our relationship with nature. We are but a product of nature and the maintenance of our physical and mental health must be based within it. FMB seeks to bring us closer to our roots, as the Holy Quran states: ‘And Allah has made you grow out of the earth like a plant,’ bringing our nature and Nature into equilibrium. Think of microwaves; they bombard food with radiation so that within one minute you have a piping hot bowl of soup. There is nothing natural about that process. Fire is an elemental force of nature and has been harnessed by human beings from time immemorial to heat and cook. At a molecular level, it brings about changes in the way nature intended. One can think of FMB as ‘slowing down’ time. Microwaves came into fashion because human society began to face a time deficit. To compensate, innovation focused on faster and faster processes that ultimately undermined natural processes. FMB endeavours to preserve those processes as much as possible. Another example is processed meals. With the advent of the microwave, ‘TV-dinners’ and ‘ready-to-eat-meals’ that proliferated in the post-WWII boom of the 1950s, traditional foods and methods became more and more obsolete. So much so that handmade food products using traditional methods such as ‘craft-sodas’, are now seen as luxury goods sold at a premium. In contrast, FMB encourages both men and women to prepare and knead the dough required to create rotī, the staple food of Bohras worldwide. Affectionately known as ‘muhabbat nī rotī’ or ‘bread of love’, this act underpins the natural way in which bread has always been made and consumed by humans; using limbs – not machines – to produce something in the most natural way possible. It cajoles one to take out the requisite time and attention to produce something which is infused with affection. To use a popular byword for positive psychology, it encourages us to be ‘mindful’ of our food, and in that process, to be mindful of ourselves and others. There is no overbearing urge to fast forward or bypass that process; in fact, that very act of kneading dough becomes therapeutic. In an age where wellness experts and the like, wax lyrical about the therapeutic benefits of anything and everything natural, FMB seeks to democratise engagement with nature. Another FMB directive emphasises this even further. In the rare instance when food goes bad, it is not disposed of in plastic bags destined for the garbage truck; instead it is buried in the earth, where it is returned to its origins. Functioning in such close proximity to nature, FMB seeks to recalibrate us with our origins too. From the proliferation of ‘butter mountains’ in Europe in the 1970s to the current stockpile of 1.52 billion pounds of frozen fruit in the US alone, we live in a world of surplus. Yet, according to various UN reports, approximately 25,000 people die of starvation everyday. That is a phenomenal figure and when contrasted with the overflowing stockpiles of food in largely western countries, it paints a sordid picture of humanity. There are a multitude of factors that contribute to this polarity of surplus and starvation and one would be naïve to discount all of them. However, one key cause of this gross disequilibrium is a lack of genuine awareness. Awareness is an innately personal thing. It needs to sprout from within. It is easy to preach from the pulpit when you stand at a distance from those whose troubles are real. Empathy and as a result, awareness, comes from real engagement. FMB inspires us to resolve that disconnect by first focusing on creating awareness and empathy within us. The ‘Dana Committees’ that have come into being as part of FMB’s zero waste policy is a noble example. After every communal meal, in almost every city where Bohras reside, a team of volunteers make sure that any surplus food is properly collected, packaged and distributed so that not even a single dāna (grain) goes to waste. Doing so is an expression of gratitude for what has been provided, for the effort of every single human being who contributed to the production of each grain and for the sustenance they have been blessed with in the face of millions of fellow human beings who have been denied that very basic of human needs.Ultimately this act of gratitude provides soulful sustenance to their sense of morality. 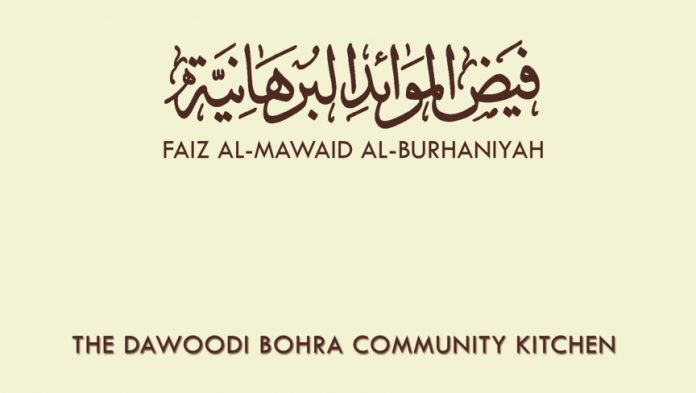 It is that very profound sense of awareness that drove the Bohra community of Houston, Texas to provide food and provisions from their own FMB kitchen to affected communities in the area. Irrespective of creed or class, Bohras joined hands with local agents in wading through flooded waters to get food to residents. And it all began with not letting that one last grain go to waste. That awareness breeds frugality because waste is abhorred. In turn, to achieve zero waste, efficiency becomes de rigueur for every process at every level. Once the individual becomes efficient, the society of which he is a part, starts to exhibit that trait. Moderation and subsequently, a more equitable redistribution of resources starts taking hold. FMB is as much about proportionality as it is about balance. It imbibes a sense of proportion in us. One can’t save the world overnight. Rather, if we really want to affect change, it begins one small grain at a time. FMB is therefore, in every sense a powerful tool for recalibrating our sense of balance. In a time where things may seem exaggerated or excessive, when fads and trends are tantamount to extremism, where social shifts oscillate left and right, where the boom and bust of the global economy entrenches inequality and disparity, where ideological battle lines are drawn on opposing sides of the political spectrum, FMB and all that it represents, becomes an oasis of harmony to seek refuge in. The virtues of FMB are embodied by His Holiness Syedna Mufaddal Saifuddin TUS. In an age of ‘short-termism’ and the bane of immediacy, it takes someone who is a visionary leader and someone who is able to transcend the limits of ‘now’, who can look into the past, the future and the present all at once, and in the face of growing disequilibrium, stem the tide and offer a lasting balance from the imbalances that currently plague our society.